So I'm back for a Saturday Share - something I've made. Because I decided I needed to make the effort to share what I'm doing regularly. 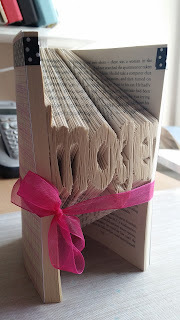 I've been teaching myself how to create book art as many of you know. So I've made this one for Sarah. Her favourite colour is green so I've decorated the cover with pretty green papers. This one is for Imogen. Again I used pretty papers to decorate. 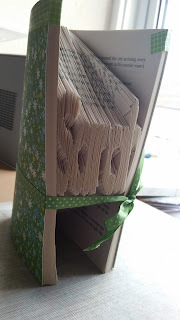 The ribbons not only look pretty, but act as a tool to balance the book. 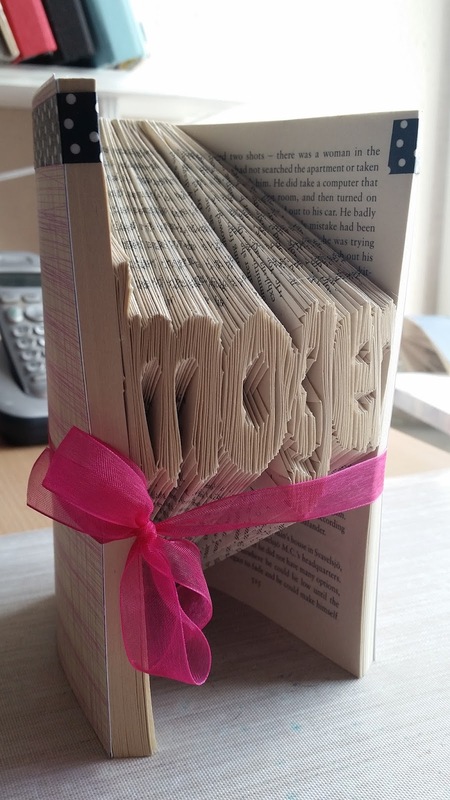 The folded area can make the book tip forwards, but by tying it with a ribbon it rebalances the weight to stop this. The other thing you have to remember is to check that the parts of writing that can be seen don't have anything inappropriate for the recipient ie swear words etc. It doesn't look good if there are any! Write down someone you had a good conversation with recently. came to see me on Monday. So we had a really good chat and put the world to rights as per usual. Seeing Debs always boosts my mood. I am lucky to have friends who support me and help me whenever I need them. You should pop over to Deb's blog - she has just had her story about her cat Ebony published!! Very exciting! Love the freshness of your new look Zoe, very easy on the eye too! Nothing like a cuppa with a friend. I should know, I've had a lot of use from my best chum this month! Wow they are FAB- So clever! They will be loved.